The Housing Chronicles Blog: Daylight Savings Time for 2012 Starts This Weekend! Daylight Savings Time for 2012 Starts This Weekend! It’s “Spring Forward, Fall Back” time again. This weekend marks the annual rite of passage in which we set our clocks forward one hour, but there are a few things you should remember this weekend when you “spring forward” for Daylight Savings Times. First, remember to set your clocks forward one hour before you go to sleep Saturday. 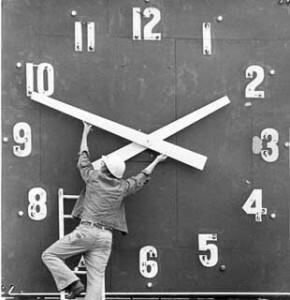 Daylight Savings Time for 2012 officially begins at 2 a.m. Sunday in the United States and Canada. Second, make time to check and replace the batteries in your smoke detectors. And third, please note that most open houses will now be from 2-5pm instead of 1-4pm and home builders' sales offices will be open an hour longer to accommodate more hours of daylight. Sure, you'll lose an hour on early Sunday morning, but this time change also marks the beginning of spring and summer. Not all areas in the United States observe Daylight Savings Time (DST). These include the Virgin Islands, Puerto Rico, Guam, American Samoa, Hawaii and most of Arizona except for the Navajo reservation. Modern DST was first proposed in 1895 by George Vernon Hudson, an astronomer and entomologist whose day job was working as a cadet for the New Zealand postal service. Since he came to highly value daylight hours for his scientific hobbies, he suggested seasonal time adjustments to the Wellington Philosophical Society, but it wasn’t until 1927 that the idea was launched on a trial basis. Many countries have used it since the, although the practice has been both praised and criticized. For example, adding daylight to afternoons benefits retailing, sports, and other activities that exploit sunlight after traditional working hours, but causes problems for farming, evening entertainment and other occupations tied to the sun. Its effect on health and crime is less clear. Although an early goal of DST was to reduce evening usage of inefficient incandescent lighting (formerly a primary use of electricity), modern heating and cooling usage patterns differ greatly. In any event, Happy Spring from Housing Chronicles!